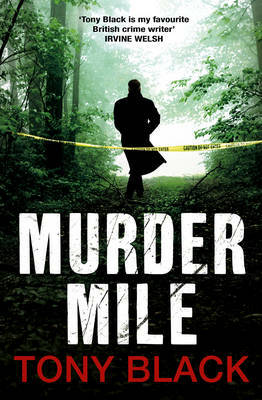 MURDER MILE is the second book about Detective Inspector Rob Brennan from Tony Black who is best known for his Gus Dury novels. Rob Brennan is a Detective Inspector in Edinburgh who finds himself investigating a murder when the brutally mutilated body of a young woman is found in a field on the outskirts of Edinburgh. This case seems to have links with an unsolved case from 5 years ago when another woman was strangled with her own stockings, sexually mutilated and had her eyes gouged out. This case was investigated by a colleague of Brennan who doesn't like him, is about to retire and would like to leave the force in glory. The work of Brennan is made worse by his Chief Superintendent who is obsessed with budgets and dislikes Brennan, whom he sees as a troublemaker. On the home front, Brennan's marriage has collapsed after some of the events in the first book and he is living in a bedsit with minimal and increasingly abrasive contact with his daughter. Though a very well written piece - as Tony Black is a very skilled writer who can depict the grim darker aspects of life with realism and yet still be highly readable - I didn't like it quite as much as TRUTH LIES BLEEDING. I feel that there are two reasons for this: the switching of narrative viewpoint doesn't work as well here as in the first book in my opinion and I found it very hard to like any of the characters. Despite these criticisms the last 50 pages or so of the novel are gripping but they do lead one to the suspicion that a third Brennan could be darker still which might make it less of my cup of tea. The question I suppose is whether I would pick up a third Rob Brennan novel - yes, I would but perhaps with a bit less enthusiasm than I looked forward to this one.